Each belief system has a story of how the world was created and human life came to be. In many of these “creation myths,” a god or gods shape, manipulative, or in some way interact with a pre-existing darkness or chaos to create order. Within Judeo-Christian beliefs, the first book of the Hebrew Bible, the Book of Genesis, describes not one, but two distinct accounts of how God created the earth, its inhabitants and mankind. This article explores the purpose of each creation story and later compares and contrasts the Genesis creation stories with an earlier Babylonian creation myth, the Enuma Elish, which dates from about 1900–1600 BCE. Scholars believe the second story is older than the first, perhaps dating to as early as 950 BCE, while the second was probably written by the priestly caste after the Hebrews had returned from Babylonian captivity sometime around 530 BCE. During the six days of creation, God adheres to a strict pattern to create order: the first three days parallel the second three days. On day 1, He creates light to create day and night (Genesis 1:5). This is mirrored on day 4, when God creates the sun, moon and stars (Genesis 1:14). On day 2, God creates the waters and sky (Genesis 1:6-7) whereas on day 5, He creates fish and birds (Genesis 1:20-22). On day 3, God creates in two stages, first dry land then vegetation (Genesis 1:11-12) whereas on day 6, He creates land animals first, then mankind (Genesis 1:24-30). The Genesis account goes to great lengths to avoid using certain words that might be associated with pagan deities. Unlike all of God’s other creations, the author avoids describing the water creation as “good.” He avoids using the singular form for sea (yam), preferring the plural seas (yamim), because Yam was a sea god in Canaanite mythology. He also avoids using the terms sun (shemesh) and moon (yareah) to disassociate God from pagan deities. By showing God created the world out of a pre-existing substance, thus creating “good” and separating it from chaos or evil, Genesis addresses the problem of evil – how God and evil can exist within the world. In polytheistic belief systems, evil isn’t a problem because destructive acts can be ascribed to the many gods capable of harming humans. But in monotheistic belief systems where only one good, moral, all-powerful God is worshiped, the presence of evil is difficult to justify. Here, God is not to be blamed for “evil” because evil was already present. God took the materials he had and brought forth goodness from them. This anthropocentric account differs from the cosmocentric account in a number of ways. Different names for God: The first refers to the Creator as “God,” or as “Elohim” in Hebrew, while the second refers to the Creator as the “LORD God,” or YHWH Elohim, YHWH being God’s Hebrew name. 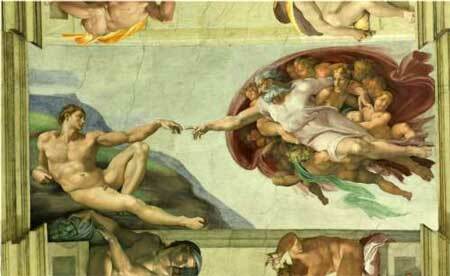 Different methodologies for creation: In the first, God creates through speaking. In the second, God takes physical actions (planting a Garden, breathing into Adam’s nostrils, etc). Different order to creation: In the first, mankind is presented as the climax of God’s creation after He created vegetation and animals. Here, human males and females are created at the same time. In the second, God first creates man, then plants vegetation in the Garden of Eden, then makes animals and finally woman. The fall of Adam and Eve is a continuation of the anthropocentric account of creation in Genesis Chapter 2. Its central theme addresses how man gained the knowledge that differentiates him from the beasts and birds by disobeying God’s direct order not to eat the fruit from the Tree of Knowledge. This story raises a few questions. Why did God want to tempt his creations? Surely, if God didn’t want Adam and Eve to eat the fruit, he wouldn’t have planted the tree where they had access to it. What was Adam and Eve’s sin? Was it the knowledge they gained by giving into temptation? Was it that they secretly aspired to become like God? Or was it the sheer act of disobedience to God’s direct order not to eat the fruit? Why is knowledge of good and evil bad? Does this “knowledge” represent the totality of all mankind could know (e.g. good and evil are extremes on the linear spectrum of all knowledge)? Or is there something special about this particular knowledge that differs from all other knowledge mankind could know? How did the serpent know enough to tempt Eve? While later Christian theology associates the serpent with Satan, there’s no evidence linking the serpent with Satan within the biblical text. The concept of Satan as a fallen angel or tempter was a much later development in Jewish theology. Yet Genesis 3 specifically describes the serpent as “more crafty than any beast of the field which the Lord God had made,” (Genesis 3:1) so we know that (1) God made the serpent and (2) God gave the serpent reasoning powers unlike other animals. Did the serpent also have free will? Did the serpent also have knowledge of good and evil? And again, why did he put the serpent in the Garden of Eden to tempt Eve? At the story’s heart is mankind’s ambition to rival God. The serpent tells Eve that if she eats the fruit, “You will be like God, knowing good and evil.” (Genesis 3:5) Thus, Eve has a choice to make – she has the free will to choose to either eat the fruit and possibly become like God or to say no. She, of course, chooses to eat the fruit and then offers it to Adam, who also partakes. Interestingly, at no point in the story do Adam and Eve become “like” God – or rival Him. Instead, they hide in fear after realizing they are naked – so their rebellion was futile. Also, if Adam and Eve could gain knowledge of good and evil, this presupposes that evil – or at least the potential for evil – already existed in the world. Evil isn’t born into the world because of Adam and Eve’s sin. It must already exist if knowledge of it exists. Regardless, the end result is God kicking Adam and Eve out of the Garden, thus punishing them for their transgressions. Did Earlier Creation Stories Influence Genesis? 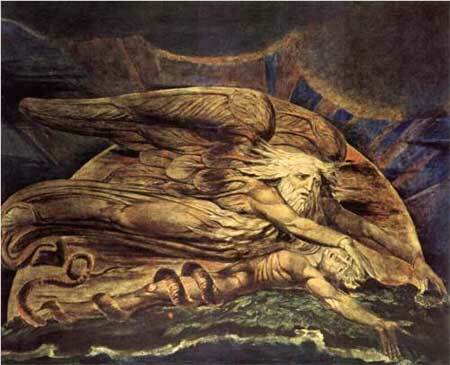 Biblical scholars often associate these two creation stories to different time frames. The first, presumed to be written by priestly caste of ancient Israel after their Babylonian captivity, is often compared with the ancient Babylonian creation myth, the Enuma Elish. Combat myths were a popular way to describe the cosmic battle between order (good) and chaos (evil/destruction) in the ancient world. Usually, chaos gods are defeated by younger gods and in the process, humanity is created out of their drama. The Enuma Elish is the oldest of these myths. According to the Enuma Elish, Apsu, “the begetter,” and the goddess Tiamat were the first two primeval entities. Both are associated with water: Apsu representing waters lying under the earth and Tiamat representing the seas lying above. These two gods bore pairs of lesser gods representing the heavens, earth and other natural phenomena. At first, all gods lived within Tiamat’s body, but eventually, her grandson Marduk rebelled, killed Tiamat, and formed the earth from her corpse. Initial state of the world – In Genesis, it is described as “formless,” “void,” “darkness,” and “deep.” In the Enuma Elish its primeval chaos. The word “deep” – Some scholars associate the Hebrew word “deep” (tehom) in Genesis 1:2 with the sea goddess Tiamat. Linguistically, the Hebrew roots are related. Naming As Act of Creation – In both accounts, the naming of objects of creation is important. Seven – The Enuma Elish is recorded on seven clay tablets, each detailing an account of creation, while the Genesis creation takes place over seven days. The Creation Order – The creation order is roughly similar: light, dry land, celestial bodies, and then mankind. Completion – In both accounts, once creation is finished, God or the gods rest. While there are many similarities between the two texts, it’s also worth noting that they also differ considerably. Number of gods – Genesis is monotheistic while the Enuma Elish is polytheistic. Mythology – Genesis tries to mythologize the creation by deliberately avoiding specific words that could be interpreted to represent other gods while the Enuma Elish offers an elaborate cosmic struggle between gods. Conflict – In Genesis, God accomplishes his tasks unopposed and in peace. In the Enuma Elish, many gods are engaged in battle. Nature of gods – In Genesis, God is distinctly different and separate from the natural elements. In the Enuma Elish, the gods represent nature. 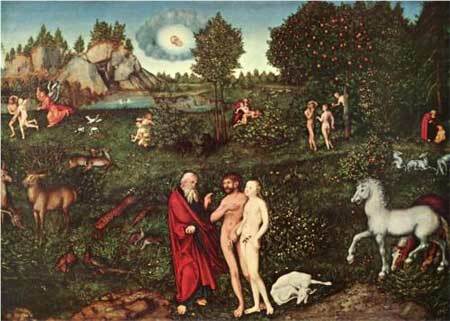 Nature of man – In Genesis, man has dominion over the earth’s creatures and has a close relationship with God. In the Enuma Elish, man is created to serve the gods. Purpose – In Genesis, the purpose is to describe how the world came to be. In the Enuma Elish, the intent is to praise Marduk. Most likely, the first Genesis account was written as way to differentiate Jewish monotheistic beliefs from the beliefs held by their polytheistic neighbors. While it can’t be proven that Genesis is a direct response to the Enuma Elish, it seems as though its author was aware of the Enuma Elish’s concepts and wanted to rebut its core polytheistic ideas. That said, even if the first and second accounts of Genesis were written by different authors during different time frames in regards to different subject matters, they are meant to be read in tandem. Each provides a unique framework for understanding Jewish monotheistic belief. The first demythologizes creation while the second explains God’s relationship with mankind and sets up the initial paradigm for human free will.